The notion of ‘bad’ foods was simply for a lack of a better term. Think of foods as more or less nutrient dense. There are no BAD foods. Well okay maybe some could be argued to fall into that category, but when looking at foods that are not made specifically to give you a heart attack, this is how food should be looked at. These are meant to show others what a healthy lifestyle means to a person and to perhaps give some ideas or find a new combo to try. It’s never about judgement. I like my food, my food makes my body feel the best it can be (well when my stomach is content for the day) and it has been working for me and my current goals. Disclaimer: Never think you need to eat the same way as anyone other than yourself. You have your own needs. My food is for my training and to help my current GI issues. So onto the post. I’m going to preface this with an “I’m Sorry” for some failed meal snaps…my bad friends. I hope you enjoy the commentary as a make up. Thanks to Laura, Arman and Jen for this fun lil linkup. Check out all of the other fun eats at Laura’s today. So for today’s commentary I wanted to give an overview as to WHY I eat some of the things that I do. Mostly, its for healing my gut and allowing for the easiest digestion, but I will share with you my reasonings below. Okay benefits of this for tummy. ~COR less fiber than my beloved oats so it digests nicer. And, carbs. Nuff said. ~Egg whites: need my protein yeah? ~Pineapple: Contains bromelain which is a natural digestive enzyme. Plus I like it. Also with breakfast, I take a digestive enzyme pre-eating and than after is a small amount of spirulina mixed with vitamin C powder in a shot glass with some water. I also take Vitamins E, A, D and a probiotic. It seems like a lot but we are trying to heal right? Lots of antioxidants and anti-inflammatories. I used to have sweet potatoes with this meal, but experienced A LOT of bloating and gas (sorry TMI) so despite my resistance (I love sweet taters! ), white jasmine rice took it’s place. Quick and fast to digest and gives me the carbs I need without the GI symptoms. Avocado is there for a bit of added fat (I can’t tolerate a huge amount of avocado, that has been discovered…its high FODMAP and rings in a decent amount of fiber) for some staying power through my 2 hour lifting sessions. *Another digestive enzyme…cough these things cost me an arm. In my bottle for during my lift, I put in a scoop each of my BCAAs and glutamine. The BCAAs I began using to prevent my body from using my protein stores for energy as my workouts are very long and I was underweight. I still use them for this reason + it helps me to take in enough water. The glutamine is for both muscle recovery and also is gut fuel. Glutamine has been found to feed the GI tract and help with it’s recovery. This is honestly something I look forward to every day. I don’t really have a sweet tooth but something about this is just so satisfying to me. All whole foods but makes me feel like I’m getting a treat. Its a ‘great job for killing your workout’ indulgence. ~Rice again..in rice cake form. These are not your cardboard Quaker rice cakes. NO. These babies have double the carbs and therefore taste so much better. They actually taste like puffed rice. These are a carb staple in my diet. ~Coconut oil: Simply added to the ‘icing’ for added calories that I can’t see as added bulk. ~Whey: I have tried eating whole proteins and they just take too long to digest when my body is literally shaking. Whey is much faster and prevents me from getting sleepy. I only buy New Zealand whey as it’s lactose free, no antibiotics and the cows are grass-fed. The ingredients are just whey, enzymes and natural flavouring. Their flavours are amazing! 3.5 organic brown rice cakes (Lundberg–> much better tasting! higher carbs= no styrofoam taste) + Protein ‘icing’ of 1 tsp coconut oil, 25g whey (I used maple), 1 tsp crunchy peanut butter, 15g melted banana and enough water to form a paste. Topped with 35g nanner. And you guess it…2 more enzymes. I take two because I think the whey makes me a bit bloaty if I don’t have the extra one. Before anyone asks, no I cannot eat vegan protein. I can’t digest quinoa or any sprouted grains other than rice. Plus it tastes like assssss..sorry but it’s true. My post workout is around 2-2:30pm, and I take my fish oil in between than and dinner but like to have something in my tummy with it as without anything it can lead to gas (hello fish burps) so I down a bit of chicken in the fridge. 1 tbsp of lemon juice before to help with fat digestion. Lobster is a special occasion when my Dad comes down. He so nicely brought some for me and of course I opened that baby the next day.. I have my vegetables for the day here…so sad. I have a small salad (unpictured) to start with all easy to digest/ low FODMAP veggies (cucumber, carrots, iceberg lettuce and some dark greens, not kale or anything). I love veggies but cannot have too much. I have roasted mini potatoes and kabocha pictured here. To be honest, I hate potatoes, so bland to me compared to sweet taters even with seasoning, but I can’t have my sweets right now and I need carbs. Kabocha is a staple (cuz what person doesn’t adore it? ), but should be limited due to being a high FODMAP and to be honest I think I have been over doing it a bit recently (anyone else find it bloats you?) because of aforementioned hatred for potatoes. And no, I eat rice all damn day so I don’t want rice for my nice sit down meal of the day.. lol. Oh and yes, enzyme number 100000 for the day and a shot of ACV. Eaten in bed. It may seem weird to you to eat fish before bed and than pair it with rice cakes and nut butter. I like to think of it as the meal and dessert. The fish is simply more protein (read below before you yell at me for eating too much protein…), the turmeric is for anti-inflammatory properties and the rice cakes are simply for more carbs. The reason I have mostly peanut butter with a shmear of almond butter is because my coach really wanted me to try to rotate almond butter with peanut butter because peanuts have a risk of moulds and such I believe..
…but I just can’t (TEAM PB!). So there, I have some almond butter. Also yes there the nut butter is strategically placed. I like a big glob for the last bite okay. Common there has to be another person out there who saves the best for last no? Shot of lemon juice (cuz that’s a large amount of fat according to my body) + …enzyme. So there is my day of eats. Very typical, as it’s pretty much the same every day with a few switch ups (fish type at dinner, choice of whey, etc) but I do that because 1. I like my food and I’m a creature of habit and 2. because it doesn’t turn my stomach into a raging….umm.monster. Anyone else out there okay with eating the same things every day? Categories: Blog Love, Food, WIAW | Tags: Blog Link Up, Blog Love, Blogger Link Up Party, Dietary Lifestyle, Food, Food Restrictions, Fuel Your Body, Gluten-Free, Gut Health, Health, IBS, Lactose Free, Lifestyle, Low FODMAP, Meal Inspiration, Personal, WIAW | Permalink. Happy start of August my friends! Hope all that had the day off on Monday enjoyed their long weekend! So I just wanted to drop a line very briefly as we move into the next month on some of my gut stuff. The reason why I thought to do this was because I actually conquered a fear yesterday morning all in the name of gut happiness.. Yes my friends. White rice. Sounds silly to be afraid of white rice, but you see, I have been afraid of white rice for years now and can say that I haven’t touched the stuff since I was like 10. Why? It’s pretty natural, so why be afraid? These are some of the many thoughts that I have believed for years all thanks to the media. So with that, I refused to eat it. Brown rice only! To be honest, I don’t enjoy rice really (boring…) so that is also a reason why I don’t tend to eat it (I love my rice cakes though!) but with all of my gut struggles, it was time to really key in on some of my diet staples and some associations started to be formed. My two hardest meals, where I now take those new digestive-aid pills (I talked about them here) is after my pre-workout and my dinner. Those are the meals that my stomach is often ready to put up a fuss that then lasts onwards either into the next morning, or throughout much of the morning and afternoon. You know what is constant in both of those meals? My bae (what do you think of this word? I actually kinda loathe it…)..
Sweet taters. My beloved orange (or white or purple!) gems. I have tried to be naive about it for so long because I just cannot fathom eating less of them then I do but I looked it up and they happen to be a somewhat high FODMAP food and are only supposed to be eaten in small doses. Whats the tummy friendly amount for most? ummm…maybe 300g…ooops. Well this is awkward. Epic fail on my part. But it’s one of my main carbohydrate sources and since my carbs are high, well so is the amount of those. Seeing that, it would be no surprise to me if they are NOT helping with my tummy struggles. So for the next week, I will be doing a white rice trial for all of my pre-workout meals to see how my tummy feels. Yesterday (1st day) it felt a bit crampy at first, probably because it wasn’t used to it, but then it was all good and actually I noticed less bloat so I hope that is what continues. So on this topic and going back to my ‘thoughts’ on white rice, I wanted to take this moment to address why those thoughts are irrational from both a gut health AND overall health perspective. Yes, on paper I can see that it’s a great option for me, especially during this time when apparently my stomach hates everything, but I also then have to battle the anxiety that has been created from those society driven beliefs that have kept me from this grain for so long. So with that, here’s why eating white rice is NOT bad for you. White rice and the body. OMG simple carbohydrate, that means a sugar spike and insulin levels going crazy. Insulin means fat gain so therefore, no rice for you. While white rice is a simple carbohydrate, it doesn’t mean that you shouldn’t or can’t eat it. Furthermore, it doesn’t mean that if you eat it you will get fat. There is a time and place for foods like this… I believe. Okay, so it is true that white rice has been stripped of most of its nutrient properties during the processing procedure, which leaves it mostly being a source of starch and not much else. This loss of fibre is also what contributes to how quickly the body is able to digest it because fibre is ultimately one component that slows the breakdown and absorption of the carbohydrates. This then does have an effect on your blood sugar and therefore insulin levels as well. That being said, who generally eats a bowl of white rice alone? Often you are eating it with a protein source and quite possibly some vegetables, both of which slow digestion of the entire meal. So just because the rice no longer has the fibre in it, that doesn’t mean that it’s a blood sugar spiker in the context of a whole meal. This is one of the various reasons why the glycemic index is flawed and shouldn’t really be considered when looking at the ‘health’ of a food item. The original study that looked into it had fasted subjects eat JUST those single food items, so yes, in those cases, things like white bread, white rice and potatoes would definitely have a larger effect on blood sugar than something richer in fibre, protein and fat. So, will white rice make you fat? No. One, because no single food makes you instantly fat. Two, you eat it with other things which will have an effect on how the body handles it. Check out this review for some info! So does that mean I can have white, processed stuff all the time? Well I’m gunna say no on this point. While I’m arguing that white rice is not bad for you, it doesn’t have the nutrients that other grains and starch sources do. So looking at prioritizing nutrients here, for pre-workout or post workout when you are looking for something fast digesting and a good carbohydrate source, white rice is great. Elsewhere in the day, I would suggest using carbohydrates with a lil more staying power. These have more fibre which will keep you satiated longer and therefore delay your next meal. One big reason why people may gain weight eating more processed foods is simply because they are hungry too quickly and end up OVER EATING and thus going over their daily calories. Fibre. Protein. Fats. Water dense. These guys keep you full! Furthermore, you have to have variety in your diet to get all of your required micronutrients (i.e. minerals and vitamins). Having white rice before my workout doesn’t change the fact that I still hit a high amount of fibre and get all my micros in a given day. So with that I will wrap it up here. To conclude I will say that I’m happy to take this leap of faith and go against what society tells me about eating white rice. I will test and see how it works as a fuel for my workouts compared to the sweet potato and also how my stomach deals with the change. Categories: Challenge, ED Recovery, Education, Food, Personal, Recovery, Things To Think About | Tags: Digestion, Digestive Issues, Education, Fear Foods, FODMAP, Food, Fueling Your Body, Gut Problems, Healthy Gut, IBS, Mental Health, Personal, Personal Growth, Personal Thoughts, Pre-Workout Nutrition, Simple Carbohydrates, Things To Think About | Permalink. Anyone else feel as though whenever they go to the doctor they end up in pain somehow? For real, no matter how many times I go I either get bad news, have to get poked, etc and people wonder why I really hate doctors visits. Anywho, I had mentioned that I had an MRI of my small bowel coming up and that was quite the experience yesterday (Friday November 13) morning. So my morning started off nice and earlier by leaving the house in the cold, tornado winds at 6:30AM. Sleepy, gross sticky mouth and hungry (I had to be fasted and no liquids), we arrive at the hospital for 7am for my 8:30am test. Within 15 minutes, the unpleasantry began with me having to down my first of a few servings of Metamucil in what seemed like a gallon of water. You guys, have I mentioned that over drinking makes me incredibly nauseous? So not only to I have to drink this crap (the orange flavour wasn’t disgusting at least), but it was like I was on a time limit because Metamucil gelatinizes within like 5 minutes no matter how much water you use. So basically I had to down this entire jug of liquid as fast as possible unless I wanted to be drinking sludge. Oh and remember this was on an empty stomach. The nurse told me typically they have patients do two..TWO!…the first round but because of my size she thought one was just fine. I almost finished it but she said I could stop with about 2 inches left in the carton as I started to get my “don’t puke” breathing going. Is that even possible? I mean I’m drinking a fibre supplement on an empty stomach. At this point, I was feeling a bit better (ie. not nauseous) when low and behold, jug number 2 comes out. My stomach is already making some interesting noises and vibrations with the one serving! Got about 2/3 of the way through that one and at that point, the thought of food or water made my skin turn just a touch more green. 8:30am came around and I was told to get changed into those lovely modest gowns (I got to keep my pants on so no peep show :-P) and was then shuffled in to get dem needles…err intravenous set up. How many servings of fiber am I at now? Orange will never be the same. So I’m getting the first needle in for my IV and I felt a bit of pressure..
Oh I’m sorry! You veins are so fragile. This one just blew.. The needle came out and she’s got gauze on it while calling to another nurse to bring her a towel..A TOWEL!?!? …no (vision getting a bit blurred)..
yeah this is bleeding a lot,… Hey I need that towel with really really hot water… Has this happened to you before? ..yeah..ummm.. I’m not doing too well. At this point I’m getting really breathy as I’m trying to stop myself from getting sick while I’m getting the impression I’m practically bleeding out and so I’m getting really woozy. Not to mention that my body decides to react to this stress by making my eyes start to well up..
Why the hell am I starting to cry. Body, what good is that going to do?!? Okay, just breathe Chelsea and try to keep your eyes open. When you close them you’re more likely to pass out. Okay well you stopped bleeding but I’m going to use this hot cloth to really squeeze on the injection site here because you have quite a large goose egg that I want to go down. At this point I could care less, I’m just trying to stay awake and not throw up. Apparently that one blew slightly but was okay. Thank gawd because I really don’t want another poking…rephrase, I don’t think I could handle another poking. Is the test over yet? She slowly got me back to my normalcy-ish, sat my chair fully back up and eventually decided to wheel me into the MRI room. The MRI really wasn’t scary at all but that could be because I was on my belly rather then lying face up. It could have also been because I was just so tired at this point from the stress out that lying down with a warmed blanket just felt so nice. Earplugs were inserted (to drown out the machines beeping) and I had to wear these massive headphones so that she could coach breathing throughout the test (nothing major but you had to hold your breath at some points throughout…so I wasn’t allowed to actually fall asleep). I also had something put on my back that felt like a rope ladder. The test was 30 minutes she said but it felt like nothing due to me being half asleep I suppose. I then was allowed to go get changed and leave with my Dad. So thankful he was there to take me home because I looked like death at that point I’m sure. When I got home I felt the awkward sensation of being slightly hungry (plus knowing that I really should be eating as it was 10am by this point) but also still slightly disgusting and bloated from the fibre. So instead of trying to force down my oatmeal (which wasn’t even appealing to me…nothing really was) that I had prepped, I listened to my body went to bed for an hour to see if I would feel better. Alarm went off and despite still feeling a bit heavy, I felt hungry enough to try to do my normal routine and get my oatmeal ready and in my belly. A lil bit more full then normal, but it sat well and after a usual post-oatmeal bathroom break (sorry TMI :-P) I was feeling kind of normal. My stomach wasn’t as bad as I thought it might be, but I did have a lot of gas and bubbling throughout the day which were not the best and I’m feeling it a bit still this morning. Hopefully it’s okay today because it’s leg day ice-cream day which I’m very excited for and, quite frankly, most definitely needed for the extra calories after not being able to eat as much yesterday. The rest of the day I got some more sleep, Andre came down for the afternoon (which was so nice :-)) and Chad arrived from Montreal to spend the weekend here. So a busy and stressful day but hey, one positive could be that I got more sleep then usual I suppose. So I’m excited for those to come in soon! Anywho, I hope you have a great weekend my lovelies and I’m off to eat my pre-pre workout meal and then head off to demolish my legs. Do you pass out when getting a needle? I normally don’t, but I have a few times and apparently now I have to warn them of that. My thoughts and love go out to the those affected by the tragedy that occurred in Paris yesterday. Please keep them and their loved ones in your hearts. Likewise, which I’m not minimizing the events in Paris at all, remember to always keep in mind and send your love to the countries (mostly all developing nations) we don’t see going through this level of massacre every day. The media censors what we can see and they try to control who gets our prayers and support. Never forget about those we can’t see as they go through this hell a lot more frequently then our developed countries do yet fail to receive the aid they need and deserve. Hopefully one day people will realize that killing is not what being human is about and solves nothing. It simply propagates distrust, hatred and fear. Categories: Personal | Tags: Doctor, Gastro, GI Problems, Health, Healthy Body, IBS, Love, MRI, MRI Experience, Pain, Paris, Personal, Prayers, Update | Permalink. So talking to Ellie over email after my last post, she had mentioned that she really enjoyed the What I Would Eat If posts when I highlighted a certain type of diet + gave you examples of what types of meals you could make with the included foods soooo I decided to bring those back. As I want to abide to the rules of Jen’s WIAW, I will keep these separate as of now. 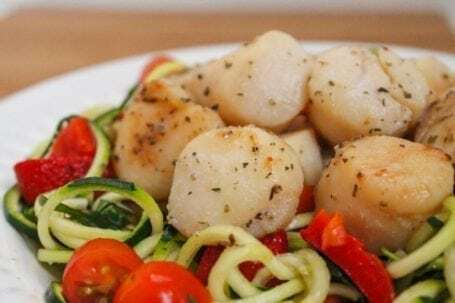 Normally something that people turn to when they are having digestive issues (IBS related), this diet is one that avoids foods that include FODMAPs or fermentable oligo-di-mono-saccharides and polyols. Speaking very generally these are specific types of short chain carbohydrates that have been found to irritate the digestive track due to poor absorption in the small intestine which leads to your gut bacteria fermenting them instead. This then leads to unpleasant symptoms of bloating, gas, abdominal pain and constipation/diarrhea. Before I move forward, lets break those carbohydrates down real quick. These are your simple sugars that make up long chains of carbohydrates or saccharides molecules. They include glucose, galactose and fructose. In this diet, the one that is of concern is fructose (commonly understood as fruit sugar), especially when a food contains a higher ratio of fructose then glucose. Chains of 2 monosaccharides. For example, milk sugar, or lactose, is made up of the monosaccharides galactose and glucose. Other common ones include maltose (malt sugar) and sucrose (table sugar). Lactose is the main culprit here. Chain of saccharides or mono-saccharides (simple sugars) that are said to be hard to digest. The ones that are highlighted in this diet are fructans, which are chains of fructose, and galacto-olgiosaccharides, which are chains of galactose molecules, as both are poorly digested and absorbed in the small intestine. These guys are famous sugar alcohols that are used so that foods can advertise “low carb” and “sugar free” on their foods as a major selling strategy. The reason for this is because these are not well broken down by the body, so they don’t end up contributing many calories due to only being partially absorbed. They are generally less sweet then something like real sugar and are often in combination with other sweeteners in foods. Some commonly seen ones include maltitol, xylitol, sorbitol, etc. I will also mention that some of these are naturally found in some stone fruits such as peaches and plums and vegetables like cauliflower and mushrooms. As I already mentioned, this diet is often one that is commenced by individuals who are suffering from IBS or other related digestive issues (Crohns and other inflammatory bowel disorders, IBD) as a method of alleviating some of their symptoms. It is very useful in pinpointing specific trigger foods that may cause individuals issues. Generally when you first start, there is a huge list of off-limit foods and then slowly over the course of diet, you gradually start re-introducing foods into your diet to see how they make you feel. If they create symptoms, then you know that your body doesn’t digest them well and they may be something to consider removing from your diet all together. This is not directed at loosing weight. This is also not meant to be a low carbohydrate diet. In fact, it states that if you remove something from your diet, you should find a nutritious alternative to avoid dietary losses. Also, this is not a permanent diet. Of course, if you find that everything on this list upsets your stomach, well then maybe it is, but for most people, it will only cause the loss of a few foods if they wish to avoid their symptoms from returning. So overall, this is meant to help you learn about what foods makes you feel your best. So now that I have cleared that bit up, lets look at those high FODMAP foods that are to be strictly avoided vs. those friendly foods. A more detailed list can be found here. This also lists the quantities of allowable foods if they have a limit. Yeah, the ‘to be avoided’ list seems a bit extensive BUT REMEMBER that this is not permanent (unless you have issues with them). You will slowly re-introduce them back into your diet to gradually to see how you respond to them. So to conclude the informative portion of this post, lets make a summary. This is not a permanent diet for most. Instead, this is a way to pinpoint the triggers of your symptoms and simply remove those foods from your diet. This resource said it best -> the intent is to lower the FODMAP load at each meal to help manage symptoms. This works best if a food log is kept (to monitor what food are introduced + feelings after consuming them a few times) AND is under doctor supervision. This is not meant to be a means for weight loss. Ensure you are getting sufficient calories from those accepted foods. For more information, check out these great sites! IBS Diets FODMAP Dieting Guide. So now onto the goodies. If you were to start this diet, what the heck would you eat? Let me help ya out with some blog love eh? Oh and I will attempt to show you more creative recipes rather then just keeping it simple because that’s more fun. For the sake of keeping things different and original, I will loose my beloved oats even though they are allowed for low FODMAP. Instead, something I have seen that looks quite interesting is this.. 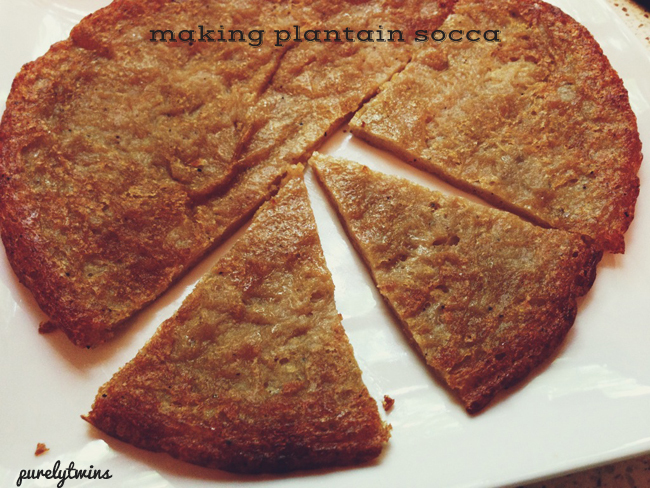 This is a super simple recipe (only 3 ingredients!) by Purely Twins that is quick to make and can have humpteen different uses. You could use it as bread (maybe think of adding some savory herbs in blend…no garlic though as that’s something to avoid. :-() or you can make it like this.. I have no words. It’s just not right. 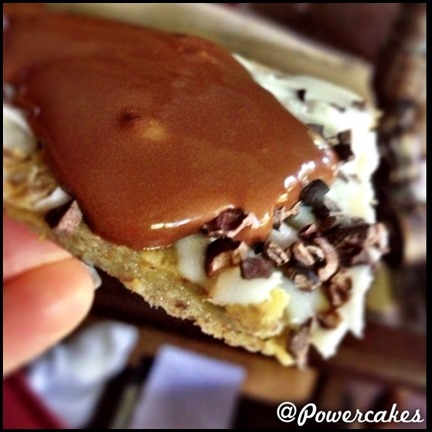 Or you could do coconut butter + cacao nibs and a homemade chocolate sauce a la Powercakes if coconut is your thang. Confession. I hate the taste of coconut. I tried to like it, I really did, but I cannot. Scrambled Egg Stuffed Baked Potatoes. Limit or omit cheese and leave onion out. No wheat? No problem, thank the sweet tater. The sweet potato acts a the main constituent of the pizza ‘dough’ with amaranth and quinoa flours, psyllium husk and egg whites holding it together. Sweet potato is a moderate FODMAP food so perhaps do half sweet potato and half squash. Go crazy with the veggie and protein toppings but watch which cheese you choose and don’t over-do it. Goat and sheep cheeses and aged varieties in general are often safe in limited quantities as they have lower lactose. I still don’t advocate the use of ‘fake cheese’ like Daiya and other vegan cheeses because 1. they are filled with chemicals, fillers and weird binders that are bad for you and 2. those ingredients probably contribute to your symptoms. Warm Salmon Salad with a Lemon, Ginger and Soy Sauce Dressing. Ginger-Curry Chicken Lettuce Wraps. Omit the scallions (no onions sorry) and make your own ginger sauce, unless you can purchase one without anything you can’t eat. I mean it’s my loves…Scallops. I also really love the idea of zucchini noodles because they just seem fun and I’m all about a plate of veggies. I need more carbohydrates. Enter again the sweet potato. Mmmm Pho. This site also gave some interesting information regarding bone broth and gut health. If beef is too hard to digest, or if you are removing beef in the beginning to give your system a digestion break, use shrimp or another form of seafood as they are easier to digest. Also sad fact, you cannot have the mushrooms. Sigh. Stacked Polenta with Bolognese Sauce. It’s like lil mini lasagnas without the noodles and the cheese. Add some veggies to the layers and you can add a small amount of goat or sheep cheese, just ensure you are under the maximum quantities described in the charts. Winter Vegetable Ragout. Omit garlic. Fresh Summer Vegetable Cod Pockets. Follow her substitutions. Sometimes better digestion comes with less frequent meals throughout the day, which is something I have found for myself, but some still need something in between so here are some options for ya! 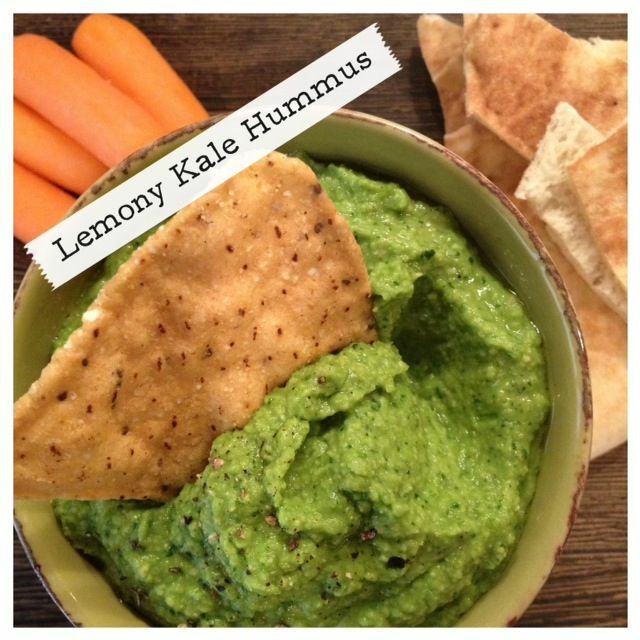 Lemony-Kale Hummus from Well Balanced. Well there ya go guys. I hope that was an interesting read for you and can be helpful to anyone with problematic tummies like myself. What would you be most sad about removing from your diet temporarily? 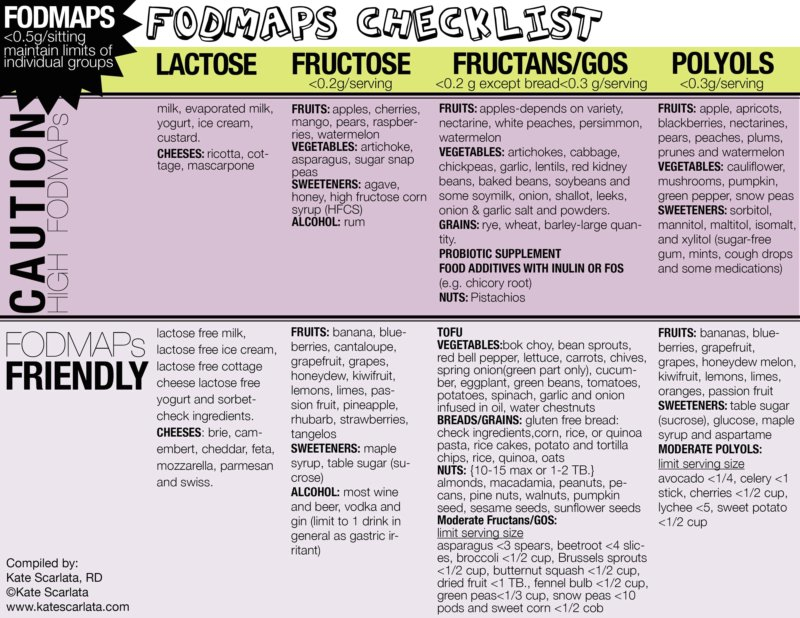 Anyone follow the low FODMAP diet already? Tried it? What’s another diet you are interested in hearing about? Categories: Blog Love, Recipe, Tips and Tricks | Tags: Blog Love, Diet, Digestive Issues, Food, Gut Problems, IBS, Low FODMAP, Meal Ideas, Meal Inspiration, Recipes, Stomach Problems, Substitutions, Tips And Tricks, What I Would Eat If | Permalink.